Aliante is an 18-hole championship Gary Panks design. As the centerpiece of the Sun City master planned community, Aliante provides a layout that is fair, challenging and enjoyable, with top notch conditioning and with landscaping that enhances the natural environment. 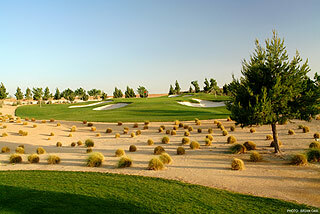 Some interesting features along the 65 acres of this design include a meandering rock lined arroyo which crosses the fairways of 14 holes, plus unique vegetation that includes Pear, Olive, Plum and Purple Locust trees, as well as the local desert pines. The clubhouse at Aliante features a well appointed pro shop, bar and grill with breakfast and lunch items, plus an outdoor pavilion with spectacular views of the course and the nearby Sheep Mountains. 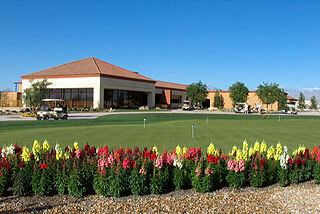 The landscaping near the clubhouse and practice green is exceptional. Those booking outings or banquets will be pleased with the outdoor space, or that available in the grill room. Practice facilities include a 50,000 square foot grass range featuring over 40 hitting stations that play to target areas, a huge putting green (14,000 square feet) plus a wonderful short game area with sand bunker and chipping area. Golfers can practice chips and pitches from various angles as hillocks and collection areas surround the chipping green. Four sets of tee boxes lead to generous fairways with yardages measuring between 5340 to 7022 yards. The championship tees play the distance with a 133 slope rating. The back tees measure 6657, the middle tees 6117 and the forward tees rate a 113 slope at 5340 yards. The average golfer can choose from either the back or middle tees - but must always be aware of the arroyos that dissect the fairways, being sure to gauge the distance before deciding to carry or lay up. 54 sand bunkers and frequent water hazards combine to make course management a priority here. Wide fairways and significant landing and bail out areas greenside will allow most golfers with a grip it and rip it mentality to enjoy a round here. Each tee area provides measurements to the center of the green, and these yardage plates are also posted on the fairways every 25 yards from 75 to 250 away. Sprinkler heads also are marked, and pin placement sheets are located on the back of the carts, which also provide ball and club washers. The opening hole is a good beginner - a fairly short par four playing to a wide and slightly rolling fairway. The second is the # 1 handicap and the longest four par on the course at 472 yards, but presents wide landing areas on the fairway and around the green. The mountain backdrop here is frame-able, as it is on the par five 3rd. Be careful off the tee here, as a desert wash crosses about 260 out. The approach is uphill with plenty of room for error past and around the putting surface. There is about 15 yards of fairway between the desert area and green on the score-able par three 4th, which precedes the shortest par four on the course. Long hitters may be able to drive the green, but a bunker complex short left makes a lay up and wedge approach more advisable. If short of the green on the long par three 6th, your ball will roll down into the collection area, making an up and down a tough proposition. From behind the green on 7, the snow capped peak of Mt Charleston can be seen in the distance. There is lots of room from tee to green on this long four par. The par five 8th also provides a generous fairway, with the approach playing slightly uphill to a putting surface guarded by traps on each side. Ditto for nine, which also demands an approach to a raised green. The tenth fairway slopes left to right with an approach from the right side the recommended play. From beautifully landscaped tee boxes, the par five eleventh demands a tee shot over a pond to a wide fairway, with an approach best played from the left side. Twelve is long but wide open, with plenty of room for error in the mounding around the green. Thirteen is a long par three that is a tough hole when the wind is up (233 yards from the tips). If you miss into the collection area short right, an up and down will be difficult. A desert wash will effect the approach to the green on the par five 14th, as this hazard crosses about 80 yards in front. Played as a three shot hole, a good score can be had. 15 is a beautiful and well bunkered par three, which again presents a tough up and down for shots landing in the collection areas or greenside traps. From an elevated tee, number 16 leads to a well bunkered fairway with a desert wash crossing in front of the putting complex- A tee shot placed to the 70-80 yard area will play nicely, but be careful if the wind is behind you as the downhill roll may take your ball all the way to the hazard. This is a tough par if the pin placement is back right. The fairway is wide on 17, but anything hit right will be lost in the desert. Unfortunately, the approach must be made from that side, as a deep bunker protects the entrance front left. The landscaping here includes a beautiful little waterfall and stream which compliments a great desert mountain background. Number 18 is a good closing hole - a par four with a desert wash crossing the fairway about 70 yards out. Aliante is set in a beautiful location and is easily accessible from the Strip. It is a very forgiving course, with generous room along the fairways and greenside. This is a beautiful course, with panoramic views everywhere. The practice facilities are some of the best around, some come early and enjoy a complimentary warm up. For more info on Aliante, check out our informational page with a link to their web site by clicking here.